If anyone has ever told you law school is easy, they are either a super genius or insane. Because it is hard. It puts you to the test. It is easy to get caught up in school and forget to take care of yourself physically and mentally. I cannot stress enough how important it is to take care of your health- particularly your mental health. 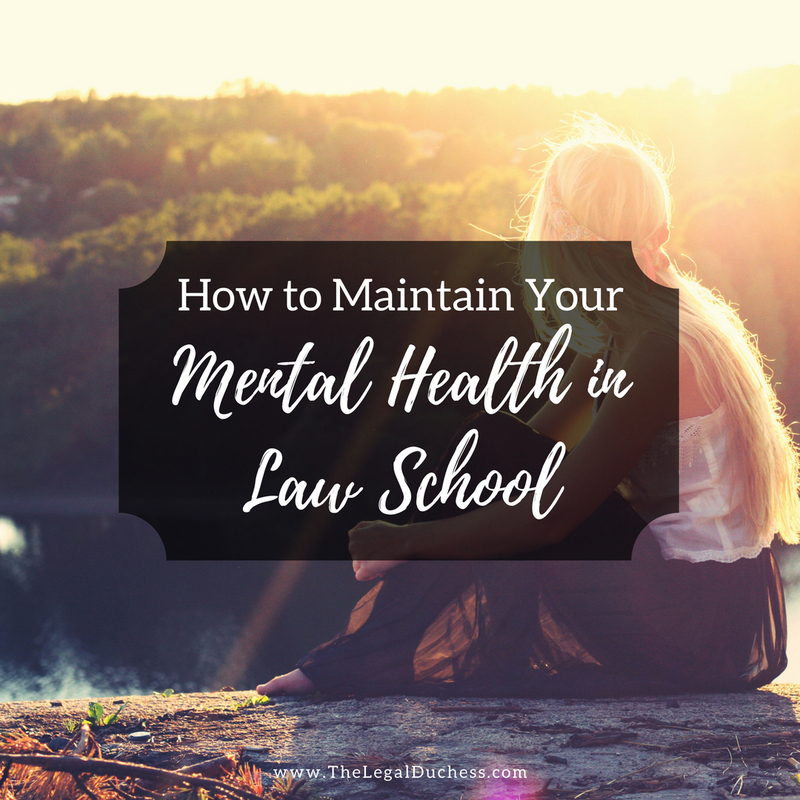 Here are some tips for maintaining mental health during law school. Law School lasts a solid 3 years followed by several months of bar preparation. You have to keep yourself moving forward toward that ultimate goal: a juris doctor. Starting out going balls to the wall and burning yourself out will not help you in the long run. Slow and steady is the goal; try to maintain a balance between school and life from the beginning and when you need a break, take one. Get a good nights sleep, spend time with family and friends, eat healthily, relax sometimes, find a way to destress and if you feel like you need help, get it. Good grades mean nothing if you sacrifice your mental health to get there. Just take one step at a time to get where you need to go. I mentioned relaxing. It is so important to take some time for yourself to relax. Maybe this is a long bath or baking a batch of cookies. Whatever settles your mind and brings you some peace, do it often. Personally, I like to bake or clean my house (just call me Monica Geller/Bing). As weird as that might be, it helps me to clear my mind and not think for a while. It also gives me something to look forward to: a sweet treat or a clean house. Sometimes I just take 30 minutes in the morning to drink my coffee and watch one of my favorite TV shows. It doesn't have to be extravagant, but finding a relaxing way to have some me-time and turn your brain off for a little while is very important when things get crazy. Law school is competitive. It is the nature of the beast and the type of people who pursue law. However, constantly being on edge and trying to compete with classmates is just downright exhausting. It is much easier to go to school and enjoy it because you have friends there. You are going to spend 3 years of your life around those people; it is much better to work toward making friends not enemies/competitors. Friends make you happy and happiness is much better for mental health. Law school is hard enough, don't go through it alone. If things aren't going well, do not try to fake your way through it. Relax, slow down, talk to someone or get some help. Faking it and letting the pressure/stress/anxiety build will cause it to blow up later on. It is much better to address these things sooner rather than later. During my first semester exams, I tried to fake it whenever I was around my husband and put on a happy face, cook dinner and be superwoman. Around exam #3, I had a complete and utter mental breakdown in front of my poor husband who just didn't know what to do to make it better. After we talked through it and I finally stopped crying and screaming, we decided that whenever law school starting to send me over the edge, I would let him know and he could take a few things off my plate and cook dinner for a few nights or clean the house, etc. I needed to give up on being superwoman and accept that sometimes, I can't do it all. Open communication and taking care of problems earlier will be so much better in the long run. I have already talked about "me-time" and relaxing. This is a little different. During law school, often you need an outlet for all the frustrations. I know some people have healthy ways of dealing with this (exercise) and others have less healthy (alcohol or stress eating). It is much better to find a healthy way of dealing with these frustrations and to let off some steam. Personally, I like doing Yoga or taking the pups for a long power walk. In undergrad, I loved spinning or kickboxing to get out my frustrations so I am currently begging my hubs to buy me a spin bike. Whatever works for you, a healthy outlet for stress and frustrations is always a good idea. However, many people turn to less healthy ways to deal with these frustrations; alcohol, drugs, stress-eating, etc. It may be easy to fall into those habits but they are not good for you long term. Try to find a healthy habit and start it before the stress hits. This way, you are already in a healthy routine so when you need to de-stress, you already have the habit of running/biking/swimming/yoga/etc. to blow off that steam. Law schools generally have great access to mental help professionals, counseling services, etc. due to the stressful nature of law school. If you are struggling- go see someone. There is absolutely no shame in taking steps to ensure your own mental health. You do not even need to tell anyone- just do what you need to do and get yourself (hopefully) feeling better. You must put yourself first and make your mental health a priority. Law school is really really hard. It tries you intellectually and mentally. Take care of yourself and keep your mental health in check because without that, it's going to be even harder. Make yourself a priority because no degree is worth giving up your health. If you ever need to talk through things, my inbox is always open. I may not have all the answers but I can always listen.